The treatment for chronic sinusitis is multiple, and in some cases there is not a “Cure”. Sometimes the goal of treatment is to produce a relief in the facial pain and chronic nasal drainage that typically marks the symptoms of chronic sinusitis. Chronic sinusitis is often caused by multiple things that effect a person’s overall health. This includes exposure to viruses, bacteria, pollution, and allergens. Individual nasal hygiene and personal habits. Nasal anatomy, immunological status, and allergies also play a major role. Effective treatment will often require a thorough investigation into the patient’s medical history, prior treatments and their use of medications designed to treat sinusitis. This may include over the counter medications or previously prescribed medications. Also important is ascertaining if the patient has a significant allergy history. Generally speaking, allergies are a response by the body’s immune system to certain types of proteins, chemicals, and environmental entities that the body reacts to in an adverse way. Typically in the nose and sinuses patients will experience nasal discharge, sneezing, runny eyes, and itchy red eyes. Almost everyone will respond to certain types of allergens if the exposure is strong enough, or the duration of the exposure is extended. Anatomic abnormalities of the nose and sinuses cause complications of chronic sinusitis by causing an obstruction of sinus drainage outlets. If the outlets from the sinuses do not drain, then the mucus that is produced in the sinuses may back up, and become stagnate in the sinuses. If this occurs a combination of allergic, infectious and immunologic reactions occur that lead to infections. This will manifest as thick discolored nasal drainage, possible facial headaches, and generalized malaise and even fevers. Treatment of sinusitis will entail evaluation of the patient’s allergic status, general health, environmental exposures, and nasal and sinus anatomy. Effective treatment should be oriented at alleviating any environmental factors like allergens, chemicals, or smoke exposure. An effective cleaning regimen should be established using some type of nasal lavage. Many physicians will combine a regimen of a topical decongestant, saline lavage and topical nasal steroid. Combining this three-tiered system with an effective antibiotic that treats the common bacteria that contaminate the sinuses id the mainstay of treating chronic sinusitis. Sometimes a mucolytic (guaifensin) and maximizing hydration will improve sinuses drainage. Prolonged use of antihistamines should be avoided because they may thicken the mucus and prevent improvement in sinus drainage. Topical nasal steroids are a much safer and more effective treatment than antihistamines. Patients need to be encouraged to try a nasal steroid for at least a month before they decide that it is not working. If a patient does not respond to a conservative regimen of antibiotics, and the above mentioned medical therapies, than a more thorough work up may be indicated including a computed tomographic (CT) study and possibly allergy testing. The reason for these two tests is to determine if the patient has an anatomic problem and/or an allergic problem that is causing their chronic sinusitis. Obviously, it is becoming apparent from the above information that the concept of a cure for chronic sinusitis is complex. Please refer to my writings regarding balloon sinuplasty, sinus surgery, nasal septal surgery, and turbinate therapy for more information regarding chronic sinusitis. Click here to see if Balloon Sinuplasty right for you. Is Sinusitis Causing My Facial Pain? When I see a patient with facial pain my goal is to determine if there is some underlying problem of the nose or sinus system that may be causing that pain. The pain sensors in the muscles, bones, tendons, and cartilage of the face are some or the most sensitive in the entire body. Think about it, your lips and tip of your nose just barely have to be touched to trigger the sensitivity of a sneeze or the pain that something is too hot. Sensitivity is not specificity. What does that mean? In the face it means that a sensation may be triggered in one part of the face but felt in another. A classic example is a “brain freeze” when you eat something cold. Pain in one part of the face, mouth, throat or neck can be triggered from a different location. Sinus headaches are a common source of vague facial pain. Some people will feel sinus pain very specifically. They will notice pain in their cheeks or forehead. The pain can be variable. It may be sharp pain that is constant. It may be a dull aching pain. Sometimes nothing makes it worse; sometimes positional changes will make it worse. Weather and temperature changes can be associated with sinus pain. Chewing can make it worse; sneezing can produce very sharp sinus pain in some people. Sudden temperature changes can trigger facial pain that is originating in the sinuses. 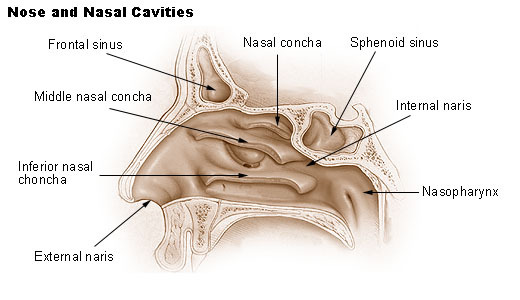 Our 3 largest sinuses: the maxillary, frontals, and sphenoid have small openings that pass into the nose. It is important for these sinus openings to stay open and communicate with the nose. If they become blocked they become susceptible to developing a negative pressure that can produce a vacuum effect in the sinus, in turn this can produce pain symptoms by stimulating nerve endings in the sinuses and the associated tissue around the sinuses. Often times patients with facial pain, especially a pressure type pain will notice that their pain is worse when they bend over or lay down. They also will notice that their headaches will increase when there is a change in barometric pressure during periods of rain. Acute temperature changes can also trigger their headaches. An example in the summer is walking from outdoors into a room that is air conditioned. Another problem will develop if the sinuses don’t communicate through their natural openings, namely infections. The sinuses produce mucus. That mucus is moved into the nose by natural forces. If that mucus cannot drain into the nose it will back up in the sinuses. It will eventually be contaminated by viruses and bacteria and can become infected. When the sinuses are infected several symptoms can occur. These include facial pain, pressure, discolored nasal secretions, malodorous breath, dental pain, pain around the eyes, temperature and facial swelling. The new minimally invasive technique called Balloon Sinuplasty (or balloon sinus dilation) can be used to dilate the openings of the sinuses. By enlarging the sinus openings, the sinuses will be able to communicate with the nose in a normal fashion. This improves the health of the sinus, allows the mucosa to cleanse itself, allows the mucus produced in the sinus to be eliminated through the nose, and generally keeps the system in a healthy equilibrium. For many patients Balloon Sinuplasty produces a long-standing resolution of the problems. It is a quick, one-day procedure with minimal risks and is performed in the office with no downtime for recovery or side effects. It is considered much more natural than continual antibiotics, nasal steroid sprays, and extensive sinus surgery. Nasal Balloon Sinpulasty cost is typically covered by insurance, so please call our office for more info. Click here to learn more about Austin’s Balloon Sinuplasty and sinus pain expert, Dr. John Austin or simply click here to schedule an appointment.